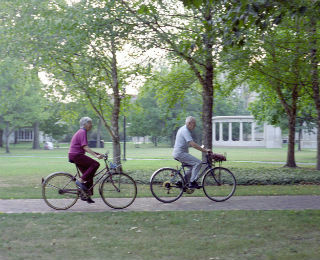 Being active as an older adult provides benefits. Added flexibility, strength, balance and a sense of well being allow us to maintain our independent lifestyle and reduce health risks that increase with age. Low impact workouts are great for increasing your heart rate, maintaining good balance and developing stamina without putting undue stress on your body. It’s important to consult a physician before beginning a new fitness regimen. The following activities are great for stretching and strengthening muscles, reducing stress, lowering blood pressure and preventing injury. For best results, combine 2 or more of these exercises and be sure to stretch before and after completion. Don’t overlook the key to successful walks: shoes. The right pair of walking shoes will help you maintain a healthy posture. Keep your back straight and your shoulders rolled back as you walk for 30-60 minutes. If you can’t walk for 30 minutes, start with a more manageable time and work your way up. Walking has many important benefits that you will reap almost immediately. Perhaps this is something you didn’t anticipate seeing on this list. Seek help from a personal trainer to develop a low impact workout catered to you. You’ll be surprised what lifting a modest amount of weight can do for your strength and bones. Hitting the links is more than a great social event with your friends. Walking 9 or 18 holes of golf is great exercise and swinging a club adds flexibility and strength. If you are new to the game, golf pros are very accessible to provide lessons. We cannot talk enough about the benefits of swimming. Flexibility, strength, balance--it’s all in there. Plus, the water acts to minimize the stress on joints as you activate every major muscle group. Don’t forget to hydrate before and after your session in the pool. You don’t need to know how to swim to take a water aerobics class. Water aerobic classes are often conducted in shallow water and combine strength training with a cardiovascular workout. Like swimming, water aerobics takes advantage of the gentle joint support provided by the water. Your body sustains minimal shock from pedaling. Stationary bikes or conventional bicycles are both great for managing arthritis pain. There are also cardiovascular benefits to this pleasurable indoor/outdoor activity. Some folks think of yoga and visualize images of young people contorted like human pretzels. Beginner classes start at a gentle pace and instructors are great with helping people learn the basics. If you’re interested in the strength, flexibility or balance that can come from yoga, get started in a class. Attempting it on your own with a DVD or internet video is tempting, but not ideal. It’s never too late to start exercising or switch to these low impact exercises to continue good health practices. Find a couple things you enjoy and start building a healthier you. If you’re searching for an active retirement living community, come see what Kendal at Oberlin and the Cleveland area have to offer. Kendal strives for wellness and fosters vibrant retirement living. Your enjoyable visit is only a phone call away!